I took a photo of Phaeton Place on our current lot. Next to her you see our newly acquired vacant lot. We are starting tomorrow to get things moving toward getting our new concrete pad poured and our canopy put up. More pictures will follow as the work progresses. We have been here for two weeks and have been in negotiations for buying the lot next to us. It was our plan to put a canopy up over the motorhome and as we worked on those plans, Terry lamented on how nice it would be to have a little extra room. We have heard repeatedly that the people who own the neighboring lot had purchased the lot for their retirement and were not interested in selling. But one never knows. Even if this was true, situations change and we thought perhaps they would entertain the notion. They did and we came to an agreement on the price and yesterday we traded money for the deed. It is our intention now to add concrete and stone and move the motorhome over about 15 feet and put the canopy up. Eventually we will add a coordinating shed, but for now we will use the one already in place on our lot. So now begins the process of getting the permits and running services over to where we wish to park the motorhome. We are anxious to get started. I will keep updating as the work progresses. We went with Mom and Dad to the hall for Thanksgiving dinner. We had a great meal and it was nice not to have a lot to clean up. We have been to Furr's to eat once, Gonzales Burgers once, the Starz drive -in once and the Crazy International Buffet once. Not bad for two weeks. We really are now trying to concentrate on eating out of the coach as we packed a lot of food into it from the "storage condo" before we left Goshen. We are going to go to Mexico tomorrow and see what bargains we can find. I have a few things I would like to get for the "new" place, so we shall see. Terry was lamenting the main decision of the day late this morning. . .
whether to change into shorts or stay in jeans. Such is the life of the retiree in the Rio Grande Valley. We have had cool evenings and nights, like you might need a sweatshirt and jeans on if you are outside. By late morning, it is considerably warmer. If the sun comes out, it will get hot. . . but the air is cool and comfortable. However, if it stays cloudy, it will remain cool. There are no wrong decisions, because even in shorts all day, you won't be cold. And if you get hot in your jeans, just step into the shade and all is well. The tricky part is that when they are burning off the cane fields, you will have clouds, but they are very short lived. So you may be fooled into thinking there are a lot of clouds, but they are not the "weather making" clouds. I won at Bingo tonight. I was the only winner in that game, so I won $10. I won last week as well, but there were 3 winners, so we had to split the winnings and I got $4 for that. We are really enjoying the weather and our time down here. With Mom and Dad here, there is always someone to talk to and ask questions. Dad has had trouble with his rotator cuff for several months and he is now in physical therapy to help it heal. Let's hope that works because he doesn't want surgery. He does believe it is feeling better. Yesterday we looked up our friends, Ron and Brenda Speidel who are camp hosting at Tradewinds RV Resort. They were lounging in the sun outside their rig, so we stopped and visited until we had to leave. They don't have too tough of a job and they have a nicely paved site and plenty of room to set chairs out and talk. Tomorrow I have to bake a pie. I am taking pecan pie and sweet potatoes to the Thanksgiving dinner, so I am going to make Terry a pie first to make sure I get it just right. Hah. We are going with Mom and Dad to the park hall for dinner on Thanksgiving. It is always good. I will probably put my sweet potatoes together tomorrow as they can sit in the refrigerator overnight and then just bake them in the morning. I'm sure after Thanksgiving the Christmas decorations will start popping up. It is nice that people in the parks don't rush into putting up their decorations and wait until closer to Christmas to decorate. I have been looking at things, but until we have a little more storage down here, I really cannot buy too much to put out. Okay. In one day I had two people complain I had not updated my blog lately, so I guess it's time to get to it. We arrived in Mission, Texas, Restful Valley Ranch, on Friday last week. It was easy getting into our spot (as opposed to the site we had just left in Rockport, Texas) and were soon greeted by Mom and Dad. Getting to the park was a little more tricky because my parents had warned us not to come in off Expressway 83 due to road construction and some pretty good "dips" across the entrances to the park. Rather than even try coming that way, we came in the "back" way and fortunately we remembered correctly! We actually never got out to the frontage road until 2 days later and WOW! "Mess" is not quite the word for it. How fortunate we did come in the back way, because Phaeton Place, at 40' long, would not have made the drive across the dips in that frontage road. Anyone planning on coming in here needs to call us first so we can tell you how to get here. In fact, most days there is little work going on there and we really cannot tell just yet what they are doing and how it will be finished. Based on the other frontage roads, I don't think we will be disappointed, but they have really cut out a lot of dirt and it is going to be a big job getting it back to the level of the side roads. Last winter when we left, they were working on a new Wal-Mart just west of us. The great thing about this is that it is just a few short miles down the road and we won't' have to fight the traffic going east toward McAllen. But unfortunately, they hit a snag. Friends tell me the store looks about done, parking lots in, etc., but they have had trouble finding water, so the store is not open. Grrr. No sign of when/if it will open. We are going to be putting up a canopy over our lot here in the valley. The sun is brutal and we have to run our air conditioners during the late morning/afternoon/early evening even though it is only in the 70's. But that is in the shade, and the breeze is cool. However, in the sun, the temperature is set at "roast" and that is what it does. HOWEVER, I am not complaining. . . I love the weather here. No bugs, a slight breeze on some days, but we just want to get the motorhome under cover to reduce the amount of cooling needed. Anyway, we spent some time earlier this week in the golf cart visiting Hidden Valley and looking at canopies and talking with people about the contractors they used. Hopefully we will be moving forward with that soon. Yesterday was Gonzales burgers day! We traveled to Donna to meet up with other RV.netters and had lunch at the famous, but hard to find, little restaurant famous for its burgers. If they are not a pound each, they have to be close. I ate half mine and brought the other half home. Next time we are going to split one. They are just too big to eat. The restaurant is really quite non-descript and operates strictly by word of mouth, no signs, etc. We were able to connect with "old" friends we met last year and met several new friends who frequent the forum. We all enjoyed lunch and visiting afterwards. What a great bunch of people! Last evening we had dinner guests. I made seafood chowder for Mom and Dad. We also had salad and Texas toast (what else?). It was yummy. Mom and Dad have a new home here! They traded models and now have a park model in place. I knew they were thinking about it and since they were kind of quiet after they got here, I suspected correctly they were working getting a new place in order. It is not much larger, footprint-wise, but it is an actual park model and has higher ceilings and seems to be a lot roomier inside. We still haven't got everything set up. Doing things just a little at a time. That way it's not such a chore. We are just enjoying the sun and relaxing, which is what we supposed to be doing! BTW, just a reminder of why we are here. My sister Nita took these pix out her front door the other day looking toward Mom and Dad's house in Indiana. Brrrrrrr. Friday was to be our last day with Gary and Jo and we took a few hours and drove over to Grand Isle. This is normally a very beautiful drive and Grand Isle is an island community, unfortunately in the path of several hurricanes over the last 4 years. This year was a double whammy with Gustav and Ike. I don't believe there are that many permanent residents, but they do have a school, so there are those who stay there year round. It seems on the south side of the island, the hurricane breeched the levee and drove beach sand up into the yards of the houses there. They no longer have grass under the stilts, but about 18 inches of beach sand. And everywhere is evidence that it is being cleared and hopefully redeposited out at the oceanfront. The Grand Isle State Park is closed and barriers across the entrance kept us from exploring. There are new power poles this time and it seems a lot of power has been restored. I have placed a lot of photos in a web album as there are too many to post here. http://picasaweb.google.com/ScottieMom/GrandIsleNovember2008# We also drove down to Port Fourchon on the way to Grand Isle and took some pictures there as well. We left Leeville and Gary and wife Jo on Saturday morning. It is always good to see them. We have fish and shrimp in the freezers now, so will eat well this winter. We drove about 120 miles to Charenton, Louisiana, and the Chitimacha Indiana Reservation and Casino. We aren't gambling, but they have a full hookup campground that is absolutely the best we have stayed in and it costs $10 a night. Since Terry and I are both history buffs we decided to visit Oaklawn Manor, and antebellum home now home to a former Louisiana Governor. The home is gorgeous and the family uses it daily, retiring to the upstairs when guests arrive to tour. That was the only disappointing part. . . the $10 price was a bit pricey for a tour of 4-5 rooms and the grounds. The difference between this home and others we have toured is that this home is not a museum and is a current residence. After hearing the guide talk about the home's history and the current residents, I would have liked to meet the former Governor and his wife who live and maintain this home for the public to continue to enjoy. The stately homes in this area were not cotton plantations but raised sugar cane instead. The fields around the home and in this area are filled with cane and are in the process of being harvested. One structure noteworthy is the aviary, which was built by Warner Brothers studios for the movie, "The Drowning Pool" which was filmed here. We have taken it easy for a couple days and getting laundry finished up. Fishing with Gary is hard work and we really enjoyed the time spent, but are ready now to move on to Texas for the winter. I tell you what. . . fishing is hard work. The worst part is getting up before dawn. Hah. But Captain Gary is determined to find you fish. I don't think he was as happy with the day's efforts as we were. Anytime you can throw your line into the ocean and catch fish is fun, even if they are not keepers. 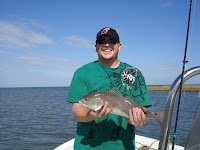 Yesterday we headed out at 7 a.m. to what Gary calls the redfish rig. 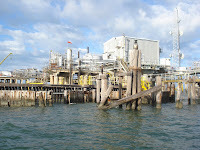 It is an oil rig and we anchored close to it and fished into the pilings. The problem was that a barge tied off to the rig had a dive flag down, so we couldn't go into the spot Gary wanted, but that couldn't be helped. We started catching fish like crazy. Gary was a little miffed because they were all catfish and he doesn't like catfish. He said these we caught have flesh the color of liver and they don't taste very good. We would have had our limit if they were good eating. Several times one of us would be waiting to have a critter removed from our hook because he was taking one off another. I think it's safe to say Gary hates catfish. Hah! And to those who are critical of us for not taking our own fish off the hooks, Captain Gary insists. Everything coming out of the ocean will either bite or cut you and he always removes the fish. Even the trout we caught have two fang-like teeth. Other fish we caught have "mouthfuls" of teeth. Gary said they have they best dental plan. We actually did catch a couple other fish at the rig which went into the box. We moved around a lot and caught a couple most places we went. Fortunately we didn't snag into the long dark objects which Gary thought might be drum, but turned out to be sharks about 5 feet long. They looked huge to me, especially the one that swam right by the boat. We fished in the bay, Timbalier Bay. We fished "at the front" which is the term for fishing right before you would pass into the ocean. A cold front was to be coming in and rain and wind was expected. Seas were to be 2-3 feet and Gary said you always add 1 foot, so the possibility of 4-foot seas kept us in the Bay. No matter. The bay is huge and we actually lost sight of land all around. Gary, however, would point out landmarks which we didn't recognize, but he did. 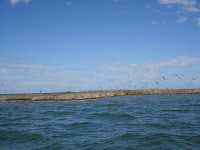 Gary drove us by Pelican Island which is a rookery for Pelicans. He talked about the changes since Gustav and Ike came through and the island is much smaller as a result of the storms. In the spring there are many more birds than we saw today, but we still saw thousands. We eventually came in and had some lunch, then went back out and fished the other side of the marsh in some canals. Brandon caught his biggest fish back there and I was fortunately to catch it on video. We continued to catch fish and we ended up with our freezer full and a large cooler for Brandon to take back to Florida. On the way out in the evening, we passed by the bridges being built. 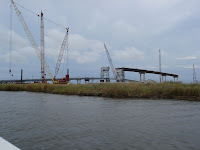 The old bridge next to Gary and Jo's cabin is being replaced by a new bridge that really takes you completely over the marsh and eventually out to Grand Isle. It is a huge project, not unlike the bridges at the Florida Keys. The bridge at the camp now has a lift section for the big boats and the horn sounds 5 times whenever the bridge goes up and then down. In addition, the steel deck is very noisy every time trucks drive over it. The new bridge will be high enough it will not move and it will be much quieter here in the camp. Just across the canal from the camp are some unusual items that are out of the water. They are actual crypts from a graveyard. One is solid concrete and not opened, so one must presume the remains are still intact. The others are brick and are broken open. They have been there for years. There is a lot of speculation as to where the cemetary was located and Captain Gary has taken many news teams (even the NY Times) over to the site to try to learn something of the crypts. Some of you may wonder about how the hurricanes have effected Leeville and this area. They are devastating. Katrina did a lot of damage here and the camp was entirely flooded. Gary's building was not here then. Gustav pummeled it with 104 mph winds for 10 hours and his cabin almost looks untouched. 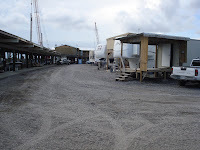 The camp was covered with 8 feet of water and the travel trailers left in the camp rolled over on their sides and slid down the rows, knocking out the power and water pedastals. It is safe to say most of the camp was destroyed. 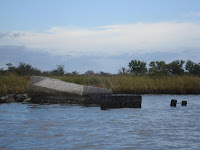 However, most of the docks remain and houses on stilts made it through for the most part. A lot of cabins out in the marsh were destroyed, however. The tenants are moving back into the camp. We are not on an actual campsite as the ones which have services are back in service with their regular tenants. 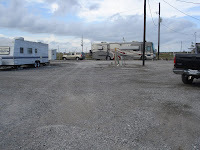 No other sites were available to us with services, so we are boondocking off to the side. Last night Brandon was watching TV as Terry and I were checking email on our computers with the Datastorm. The air was on. Brandon said, "So this is boondocking?" Yep, our style of boondocking anyway! We are in Leeville, Louisiana, at the fish camp where Gary and Jo have their cabin. Their cabin is built on pilings 14 feet off the water. The first row of pilings are on the land, the next 2 rows are in the water and the cabin sits atop those three rows of pilings. What a view! Their cabin is beautiful. It really turned out nicely. It has a kitchen and great room, master bedroom with private bath and 2 other bedrooms with a bath. They had it completed 3 months before Gustav went through. They had water up to the 8th step going to the cabin and 104 mph winds pounded it for 10 straight hours, but the only damage they had were some lost ceiling strips. Wind came in through the end of the roof cap, but there was no other damage. Wow! Were they lucky. Then came Ike. Water came up even higher, but I don't think they had the wind with Ike. The camp was entirely flooded and mud was everywhere. You can still see remnants of the mud. The owner is bringing in gravel and leveling out the land. We had to move our motorhome from where we had parked yesterday because they were bringing some in where we were parked. Fortunately we are used to moving and got that done in short order. In fact, we decided to stay here since we are boondocking anyway. We now face the water which is quite nice. Several of the seasonal campers have pulled in and they have some of their services, but nothing is done on the back row, so we don't have water or electric. We knew that was a possibility coming in, so we're cool with that. Gary and Jo have graciously allowed us to use the showers in the cabin, so that has been great! There is still a lot of devastation in this area. We do plan to make a run out to Grand Isle before we leave to see what it looks like. On to the fishing report. We went out this morning and stayed until about 12:30. We caught some redfish, drum, and sheephead. It was a lot of fun and especially catching different kinds of fish. Usually I only know what one looks like. Hah! We traveled through various areas of the marsh. I was surely lost, but not Captain Gary. He knows where he is going and what he is doing. Gary is Terry's first cousin. He is actually a former teacher/principal and Georgia Pacific employee. He has always enjoyed fishng and hunting and decided to turn a hobby into a profit making venture. So he and another partner formed Lewis and Harp Coastal Fishing Guide Service. They can be found here: http://www.lewisandharp.com/ He has been featured on Redneck Outdoor Adventures before and is considered "King of the Mangrove" for his ability at ferreting out the Mangrove Snapper fish. We came in for a quick lunch and to let our dogs out and then we went back out. This time we ran into trout. We caught a lot of white trout which Gary says is very good eating. They were small, but there is no size limit nor a count limit and so they went into the box. We have been seeing dolphins every day. They play in the water and are fun to watch. Imagine our surprise when we were fishing and all of a sudden a dolphin breaches the surface and leaped in an arc out of the water! Hah! He did it again, and me without my camera in my hand! Gary cleaned fish for supper which were absolutely delicious. Plans are to go out in the big boat tomorrow out into the bay, I think. He has a Boston Whaler which is 10 feet wide. We intend to do some serious damage to the numbers of fish in the ocean tomorrow! I am including some pix from today. We waited until almost dark to come in, which was about 5:15, so I got a picture of the sunset. Brandon, our son, is the youngest member of the party and I have a few pictures of Gary and Terry. Wish us good fishing tomorrow! We arrived at Cousin Gary’s last Friday and have been visiting and sightseeing since then. Gary and wife Jo enjoy showing us around Baton Rouge and we certainly have not been disappointed. Friday evening we went into Baton Rouge for “Alive at 5” which is downtown in front of the “old” and very unique capital building. There were lots of people milling around and a live band which was quite good. We walked around and across the downtown streets on an elevated walkway right down to the Mississippi River and looked around. Across from us on the west side of the river was the Port of Baton Rouge. Right next to our observation platform was docked the USS Kidd, which we think is a destroyer. It is open for tours, but not at the time we were there. It was a very enjoyable walk not even cool enough to warrant a jacket. Lovely weather. After we left there, we drove to “Camille’s” for a seafood supper which was very tasty. I got the grilled shrimp salad and Terry got the shrimp augratin. Both delicious. Jo and Gary really know great places to eat. Saturday was spent visiting the new Bass Pro Shop Outdoor World and a few other places before stopping for lunch. We then headed home and that evening Chris and Cody, Gary and Jo’s son and grandson came to spend the night after deer hunting. Yesterday afternoon we went down to Sam’s Club to get a few things we needed. Last evening Gary and Jo put on a wonderful fish fry. We had fried and blackened grilled fish, french fries, cole slaw, tossed salad, corn casserole, Texas toast, chocolate cake and ice cream. Wow what a feast! Jo invited a lot of relatives to come in and we had a really great time visiting with the family and seeing little Bodie again. He is Jo's daughter's first child and he is a cutie pie. Today Jo had to go to work and the guys had some “guy” places to go. I elected to stay here and do some laundry. We are headed to Leeville, Louisiana, tomorrow to do some fishing with Captain Gary. Our son, Brandon, is driving over today from Florida, and is going to go with us as well. He has wanted to go for a long time and Gary didn’t have any charters this week. The fishing is really good right now and we are hoping to stock our freezer.